With a humbucker added to his Stratocaster in the middle position, Wayne Kramer, Fred "Sonic" Smith and the MC5 defined proto-punk and agit-prop music in the 1960's. 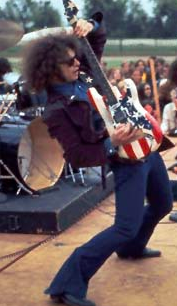 “When I founded the MC5 and we started to play out, I wanted to develop a look. I was a big fan of Pete Townshend, and I noticed that Pete had a sport coat made out of the Union Jack motif–the British flag–and I thought, ‘What a great idea, but I’m American."